“God of life, You made me in Your perfect image, to live in Your love and to give You glory, honour and praise. Open my heart to Your healing power. Come, Lord Jesus, calm my soul just as you whispered “Peace” to the stormy sea. Prayer: Grant us, O merciful God, protection in our weakness, that we, who keep the Memorial of the Immaculate Mother of God, may with the help of her intercession, rise up from our iniquities. Through our Lord Jesus Christ, your Son, who lives and reigns with you in the unity of the Holy Spirit, one God, for ever and ever. Amen. Today are the optional memorials of St Jerome Emiliani, a priest, and St Josephine Bakhita, a virgin. O God, Father of mercies, who sent Saint Jerome Emiliani as a helper and father to orphans, grant through his intercession, that we may preserve faithfully the spirit of adoption, by which we are called, and truly are, your children. Through our Lord Jesus Christ, your Son, who lives and reigns with you in the unity of the Holy Spirit, one God, for ever and ever. Amen. O God, who led Saint Josephine Bakhita from abject slavery to the dignity of being your daughter and a bride of Christ, grant, we pray, that by her example we may show constant love for the Lord Jesus crucified, remaining steadfast in charity and prompt to show compassion. Through our Lord Jesus Christ, your Son, who lives and reigns with you in the unity of the Holy Spirit, one God, for ever and ever. Amen. Today is the memorial of Sts Timothy and Titus, bishops. Prayer: O God, who adorned Saints Timothy and Titus with apostolic virtues, grant through the intercession of them both, that, living justly and devoutly in this present age, we may merit to reach our heavenly homeland. Through our Lord Jesus Christ, your Son, who lives and reigns with you in the unity of the Holy Spirit, one God, for ever and ever. Amen. 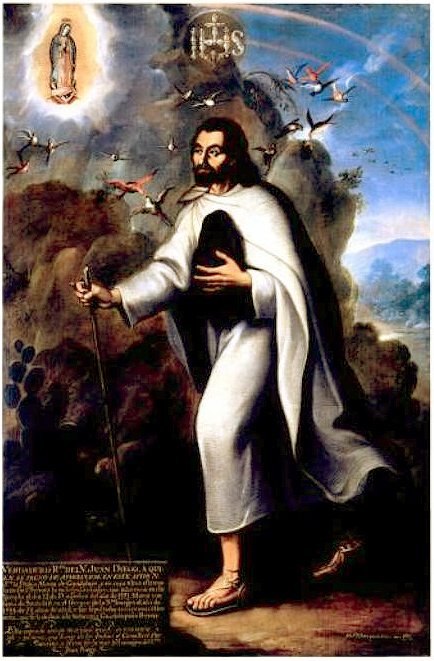 Today the Church in the United States celebrates the optional memorial of St Juan Diego, an Indian convert, to whom the Virgin Mary appeared as he was going to Mass in Tlatlelolco, Mexico. Our Lady asked him to tell the Bishop that she desired a shrine to be built on the spot to manifest her love for all mankind. She left a marvelous portrait of herself on the mantle of Juan Diego as a sign for the Bishop. This miraculous image has proved to be ageless, and is kept in the shrine built in her honour, the Basilica of Our Lady of Guadalupe, Patroness of the Americas. Prayer: O God, who by means of Saint Juan Diego showed the love of the most holy Virgin Mary for your people, grant, through his intercession, that, by following the counsels our Mother gave at Guadalupe, we may be ever constant in fulfilling your will. Through our Lord Jesus Christ, your Son, who lives and reigns with you in the unity of the Holy Spirit, one God, for ever and ever. Amen. Today is the memorial of St Andrew Dung-Lac, a priest and martyr, and his companions, martyrs. Prayer: O God, source and origin of all fatherhood, who kept the Martyrs Saint Andrew Dung-Lac and his companions faith to the Cross of your Son, even to the shedding of their blood, grant through their intercession, that, spreading your love among our brothers and sisters, we may be your children both in name and in truth. Through our Lord Jesus Christ, your Son, who lives and reigns with you in the unity of the Holy Spirit, one God, for ever and ever. Amen.